Recently, I’ve discussed how much of a huge disappointment the AirPrint feature has turned out to be for the recent iOS 4.2 update, despite lots of hype surrounding it. Apple had originally said that it would work on a wide variety of wireless printers, and that it would work on basically all shared printers. However, upon release, it became apparent that it only worked on a small handful of HP wireless printers and Epson, and virtually no shared printers, which made it pretty much useless for the vast majority of iPad users. It’s really easy to be disheartened by this, given that Apple essentially made promises on a product’s functions that it didn’t follow through with. Because Apple had originally designed AirPrint to work with shared printers, the code was there in the original software release to make that work. It just required someone to find the code. That someone was developer Steven Troughton-Smith. Essentially, what the app does is make your iPad or iPhone think that your shared printer is one of the HP wireless printers that AirPrint is currently compatible with, and make it work with your printer. 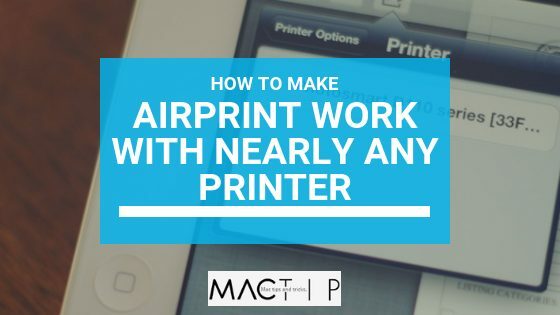 It’s a clever way to trick AirPrint into working in ways it had not previously. Several other apps that are similar to this one has been made, but I’ve shied away from them. The reason that I like AirPrint Hacktivator is it makes very minimal changes to the program, it backs up the one file that it alters, and the changes it makes to the program are very easily reversed. This means there’s no real risk involved in using the program. If it doesn’t work, or you don’t like or need it anymore, you can simply remove it, without removing any files from AirPrint, or your devices. Download AirPrint Hacktivator’s latest version, which is version 1.0 at the time of writing this. Unzip it, and then launch the application. Upon launching the application, you’ll see an ON/OFF toggle button. Click to turn it on. You’ll need to enter your password in order to approve this change, and then hit “OK” to submit. The application will then present you with a popup to tell you what to do under “System Preferences”. Go to “System Preferences” and then “Print & Fax”. It’s important to note that you MUST remove the printer and then add it back in the process described above, or using this application isn’t going to work. You cannot simply use the application to print whenever it loads up and shows your printer listed as shared under “Printer & Fax”. After you’ve done this, you’re ready to use AirPrint to print from your iPad or iPhone from all of the supported apps. Tap the “Share” button. It looks like an envelope with an arrow coming out of it. Choose “Print” from the options list. A dialog will pop up. Tap the Printer field. AirPrint should start searching for printers and find yours. Select your printer, and print. 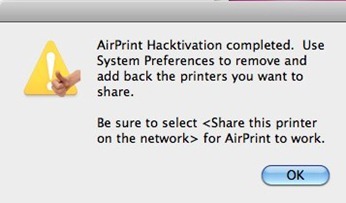 Recently Apple sent the makers of AirPrint Hacktivator a request to take it down. They had to comply with the request. However, they almost immediately came back with a new app. This app doesn’t use Apple files, and there’s therefore no way for Apple to have a problem with the app or tell them to take it down again. The new app is called AirPrint Activator and this article has been revised to include links to it, as opposed to the AirPrint Hactivator app that no longer works. As of now, we don’t know why the shared printer feature doesn’t work organically through AirPrint, or why they pulled that feature. And it is complicated to understand why one must even use AirPrint Activator. But, it boils down to the fact that Apple said they were going to make AirPrint work with shared printers, then they didn’t follow through with that, pulling the feature at the last minute. AirPrint Activator is a relatively simple fix that will make your AirPrint work with your shared printer/s. And, there’s no risk involved with the app. You can remove it, and it won’t mess up any of your files or devices. So, it appears to be the best option to fix the problems with AirPrint for now, unless Apple comes up with an update for the AirPrint that includes the features that the AirPrint Activator makes accessible. Until then, AirPrint Activator is the way to go. How to fix slow shutdown and startup times.